Normally you don’t think of luxury when you think of camping. We also thought it could hardly have been more luxurious with the super luxury folding trailer from Opera. But when you go out on a camping adventure with the Volkner Mobil Performance S, you are really enjoying quite some luxury! 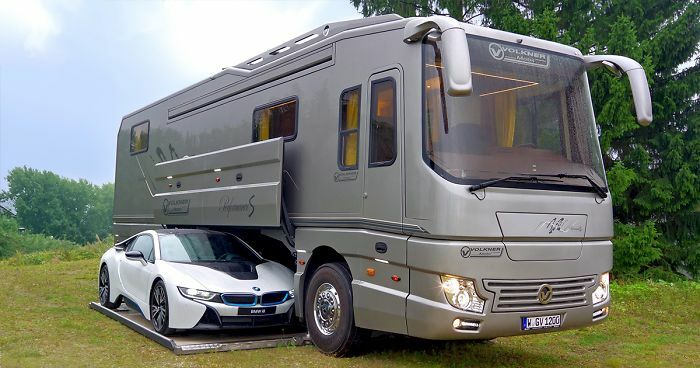 The camper therefore costs no less than 1.4 million euros. We dare to say that this is the most expensive motorhome ever made! This is actually a 5-star hotel, but on wheels. In this super luxury 12-meter camper you will find a fully equipped kitchen, master bed, large lounge area and a heated bathroom. The luxury caravan even offers a garage in the camper with an electric hydraulic lift! Check the video below if you can’t believe it.